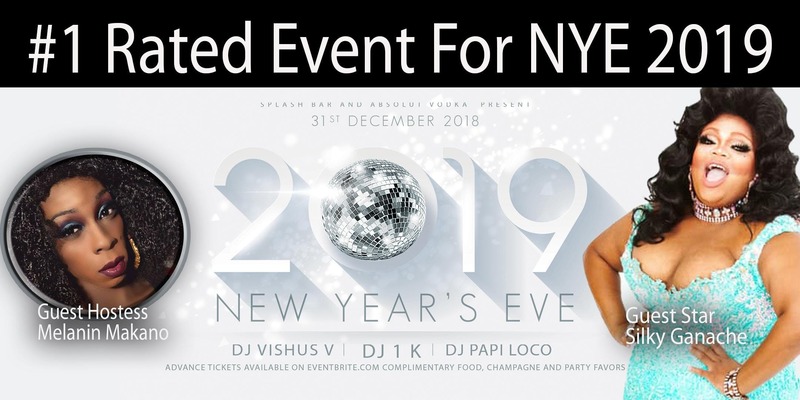 New Year's Eve In Panama City Beach only gets better every year with Splash Bar bringing the best Female Impersonation in from all over the country, this time with a true Southern Entertainer from the deep South, but by way of Chicago, Silky Ganache. Silky is known for working EVERY inch of a ROOM and dancing so hard the rafters move! So punching it on down to PCB for New Year's is a sure bet! (It's also Silky's Birthday). Complimentary Food, Champagne and Party Favors included in the ticket price or cover. You will be seeing a lot of Silky in the Spring of '19, so this is your chance to get up close and personal with this entertainer before the rest of the world discovers her. Spinning NYE weekend are DJ's 1k, Papi Loco and Dj Vishus V, with shows on Saturday, and Monday night (NYE) featuring the Splash Dolls and Moday's Guest Silky Ganache. The shows on Saturday are at 12 and 2am, and Monday Night at 11:15 and 2am with Guest Hostess Melanin Makano. Those people that had purchased tickets for Halloween 2018 can use those tickets for NYE, due to Hurricane Michael's appearance. Doors open at 8pm Saturday, 7pm Sunday (with Karaoke) and 8pm on Monday Night New Year's Eve.